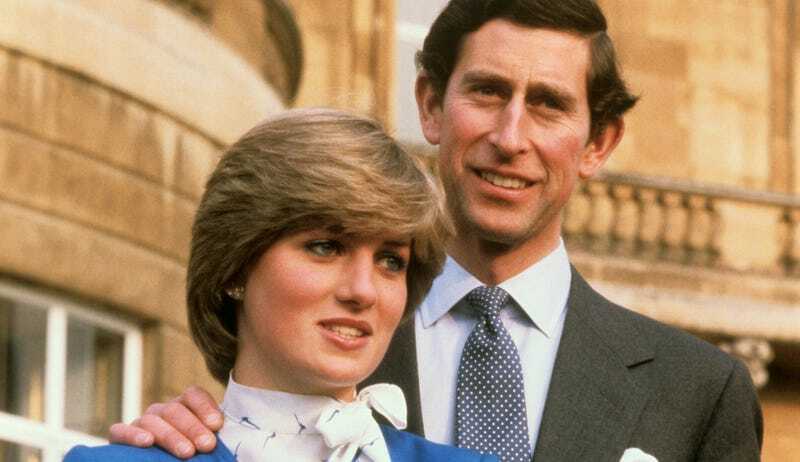 On this day in 1981, Princes Charles officially announced his engagement to the beautiful, 19-year-old Lady Diana Spencer. Sadly, we know how it all turned out, but there’s no question it launched a thousand tabloid pages. Upon making the announcement, the couple duly submitted to an interview. While putting a wrap on the conversation, the reporter slid in with, “And I suppose, in love?” Diana replied, “Of course!” Out of Charles’s mouth popped a very philosophical: “Whatever ‘in love’ means.” Oh, God. Is it possible to cringe to death? Not long after Diana embarked on her first public engagement as a royal-to-be, appearing at a benefit for the Royal Opera House Development Appeal. As you can see from this clip, it didn’t take long for the media to begin commenting on her clothes: “By normal royal standards, it was fairly revealing.” No offense to Queen Elizabeth II, style icon, but by royal standards a head-to-toe terrycloth robe sewn completely shut is revealing. But of course at the time everyone was very determined to see this as the romance of the century, the ultimate Cinderella story. You could make a decent case that the ensuing wedding, an unbelievable media frenzy, singlehandedly saved the bridal business, putting it on track to become today’s reality-show behemoth. You’re welcome, Kleinfeld’s.